This Guy makes a film slitter for cutting down 120 to 127. And he says it cuts down the paper as well. I bought one of his slitters, to cut 35mm down to Minolta 16mm. You have to specify what you want and he makes it. Dan, thanks for that! You are becoming an enabler... this puts me one step closer to a Baby Rolleiflex... all I need now is to be able to use Double X 35 mm film in one with maybe a mask to compose inside the sprockets! THAT would be amazing shooting Double X! I finally dove into the shutter on my gray Baby Rollei and found a bent linkage arm in the self timer area and old grease/oil on the shutter and aperture blades. Now it's cleaned up and working. Next step, break into the 127 vault and put it through. Thanks for the inspiration, cassel! My "New to Me" Baby Grey Rollei arrived last night. It looks like it was rarely used, and the taking lens is crystal clear. This morning I dug out a roll of expired Efke 100 and took it out for a spin. First frame worked fine, second frame, kept winding and winding, #2 wouldn't come into the window. Total roll screwed up. Put in another roll, made it to frame #3 then same thing happened. Took a dummy roll and kept running it through the camera, over and over again, until eventually everything was working right. Loaded a fresh (expired) roll of Efke 100 and it worked properly for all 12 frames. It's a fun camera to shoot (when it's working properly). Below are a couple random pics from the neighborhood. I love the images you posted... looks very promising! Now we have to get into the 120 conversion to 127 film for real!! Have you looked into it much? Doesn't 16mm film need sprocket holes though? I think this thread is the epicenter of Baby Rolleiflex shooting in 2017-2018! Unless there's a TLR or Rollei-specific forum I am unaware of. This is the place to be! I sliced down a roll of Kodak Ektar 100 which I had originally bought for my Voigtlander Perkeo 120 camera. This one I had to send to The Darkroom in California. Fast service! I dropped it in the mail on Saturday and was viewing my scans online on Thursday... And that was with the P.O. having a holiday on Monday. I should be getting the negatives and CD back today I think. This is from the online scan... Ektar is a super-saturated color film, like Fuji Velvia but its a negative film instead. 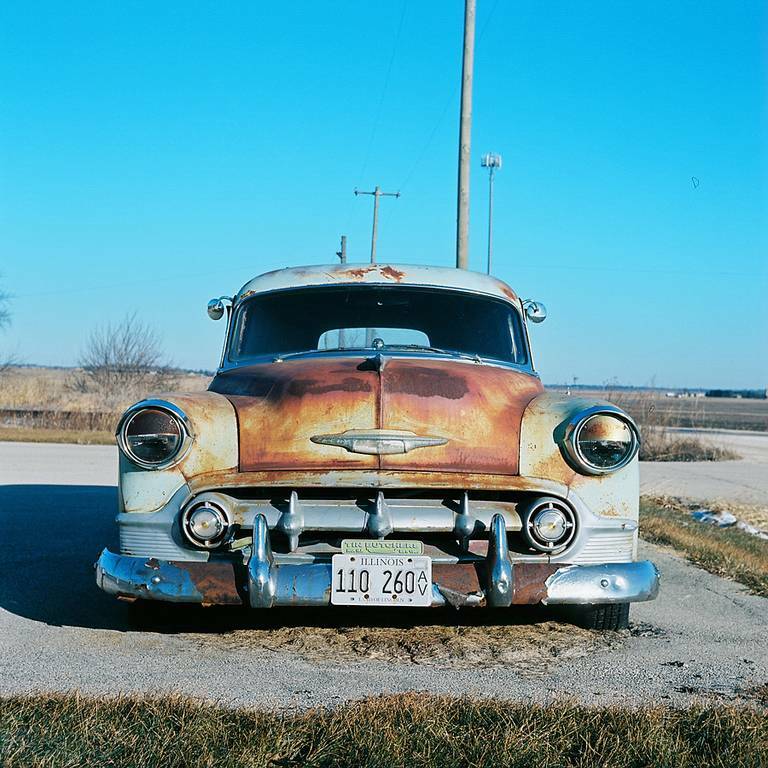 The blue sky looks kind of candy-colored but the film really brings out the patina in this (one of my regular photographic subjects). A beautiful wabi-sabi '52 Chevy! Dang, I wonder what that would look like on Velvia.... hmmmm. That is very nice, and I will move back into some color film soon because I see the excellent possibilities. For now, I will work with B/W for awhile. There are a lot of things happening on this end! I sliced down a roll of Kodak Ektar 100 which I had originally bought for my Voigtlander Perkeo 120 camera. What have you settled on for slicing down your film? I've got a couple rolls of Tri-X and two empty 127 spools with backing paper. Are you cutting the film down when it's still on the roll? Or unwinding the film and slitting the film by itself? I've looked at that film slitter listed on the auction site, and my concern is that you would have a great chance of scratching the film as you run it thru the top and bottom plates of that slitter. I have found a number of people using a cigar cutter! Ingenius!!! I slice it while its still on the roll. I am going to post a pic, or hopefully write a How-To. I leave it rolled tight with the adhesive band still attached, and I made a kind of cutter like a guillotine. I do the cutting in the light... Dim room light, but at least its not pitch dark. The fussiest part is making sure the width is right. Then I go into the darkroom and roll it onto the 127 spool. While doing so, I trim the paper at each end and trim the film also and install a new piece of tape. Note that if I re-roll it only one time, its now "backwards" on the spool and the original tape will be on the wrong end. I just remove the original tape. But if I re-roll it a second time the tape will be at the correct end. I'll post some pics soon, I promise. Yes! Can't wait to see how you do it! Thanks! Thank you for this. Do you do anything to shorten the length of the actual 120 film, as the piece of 120 film (regardless of the backing paper) is longer than a 127 piece of film. Do you cut the 120 film down to the 25 and 1/4 inch length of a 127 piece of film? And if you don't, does that give you like 15 or 16 frames with the Baby Rollei? And does it also cause the newly spooled cut down 120 roll to be too fat to work properly in the Baby Rollei? I know, too many questions. This morning I dug out a roll of expired Efke 100 and took it out for a spin. First frame worked fine, second frame, kept winding and winding, #2 wouldn't come into the window. Total roll screwed up. Put in another roll, made it to frame #3 then same thing happened. Took a dummy roll and kept running it through the camera, over and over again, until eventually everything was working right. 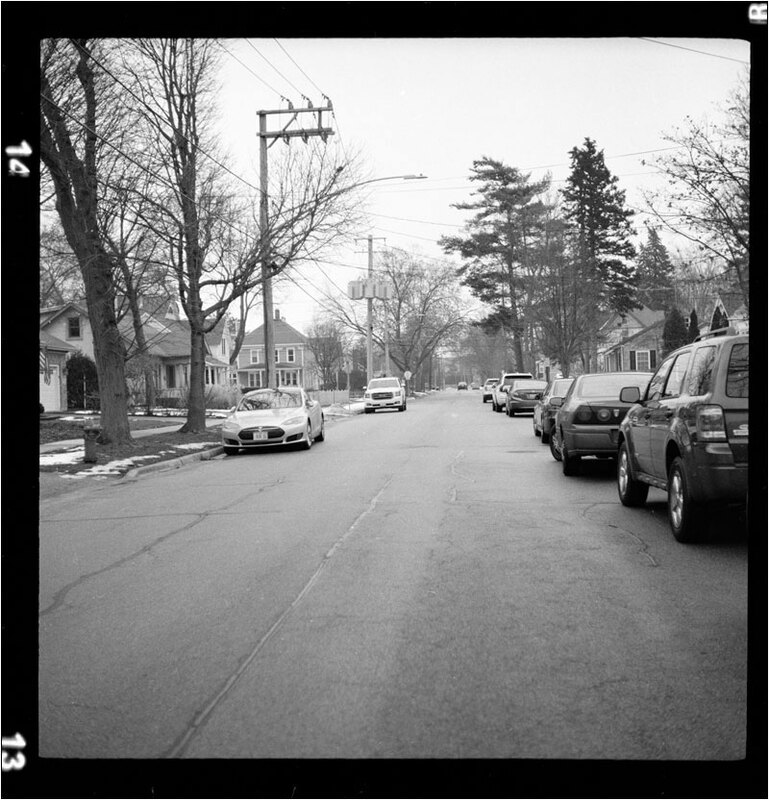 Loaded a fresh (expired) roll of Efke 100 and it worked properly for all 12 frames. It's a fun camera to shoot (when it's working properly). The film transport mechanism on Baby Rolleis, at this point in time, is a potential point of trouble on bodies which have not been serviced. It is a fairly well known issue. They can be very sensitive to film and paper thickness if not properly adjusted/out of spec, the result being exactly what you describe. For whatever reason, many people also report issues, no matter how well adjusted the body is, with film on the later plastic reels. Metal spools are the best bet for using in Rollei 4x4s. Again, this is a known issue. "Back in the day" there were no plastic spools, and no issues. The only other known issue with these cameras which I am aware of is that the interlock (poor word choice on my part) between the shutter and the self timer was a weak point over time. This can result in a jammed shutter and a bricked camera. Safest way forward is either to not use the self timer at all, or use it sparingly. Googling, as ever, turns up more detailed information, some correct, some incorrect. As ever. Having said all that, these are great little cameras, fun to shoot, with pin sharp Tessar lenses. Like an Elmar-m combined with a larger negative. Yes, you definitely need to have the film the correct 127 length, and, yes, too thick will definitely cause problems. The best way forward is to obtain an unused roll of 127 film off ebay, measure the film length, measure the backing paper length, which is about 6" longer than the film at one end, and 11" longer than the film at the other, from my memory, and duplicate that. Assemble your new roll exactly like the n.o.s. roll, taped accordingly and you are good to go. There are pros and cons to using the cigar cutter, but it's a good start. Maybe it has already been mentioned, but ideally you want the film and paper to be of the same dimensions as original 127 film. The film itself is 46mm wide, the spools and backing paper are wider than that to prevent the light leakage problems which are prone to occur if the film is run right up to the edge of the paper, and you try loading or unloading film in daylight. The paper is around 1.25mm wider than the film on both sides, don't recall exactly. Using a cigar cutter to cut 120 down is fine, but ideally you would just want to cut it down to 46mm, pull the film out, throw away the 46mm wide paper you just made, cut the film length to proper 127 length, and assemble the film with some other backing paper of the proper 127 width, which you prepared previously from a used 120 roll. IOW, don't throw away the backing paper from 120 rolls you develop when you do medium format, save it for this. Once assembled, wrap your nice new roll of 127 film in aluminum foil until needed. The other potential issue with just cutting down 120 film, paper and all, with a cigar cutter, then sticking the whole thing on a 127 spool is that you need to get the width of paper/film pretty much exactly right-for the entire roll. Which isn't the easiest thing to do. If you can reliably do that, hat's off. If there is one part on the roll which is wide enough that it is tight up against the inside of the flanges of the spool, you will have problems with film advance and uneven spacing, or no spacing. It was hard for me to use the cigar cutter without having the cut edge be a bit wavy, but perhaps that was just a problem with my cutter or me. Best solution, for me, was just to buy 46mm film in 50 foot rolls from Ilford's yearly ULF program, and assemble that on properly sized backing paper cut from 120 paper which would have otherwise been discarded. Then there are no issues with the light piping which results from film edges being concurrent with paper edges, and no issues with the lengths of anything. It's not difficult in the long run. Larry brings up several important points. Whatever method you decide to try, you have to be VERY careful that your finished film is the correct width. If its too wide, it might bow slightly between the two tabs on either side of the pressure rails and thus create a soft-focused zone right in the middle of each picture. It also might create issues loading it onto your processing reels. This is in addition to the film transport issues Larry mentioned. If it is too narrow, the film is likely to fall off the spirals of your processing reel. At least with my vintage Nikor 127 reel, the acceptable tolerance is very small. Maybe 46mm plus or minus a half millimeter. Anything more or less than that is going to have issues. I too have had issues with a wavy edge. A roll with a wavy edge might possibly have a badly-focused photo at every wide spot. It took me a while to figure out what was causing this on mine. I had a lot of troubles using the cigar cutter... The one I bought wasn't wide enough to fit over the flange on the end of the 120 spool, so I had to file that off first, being careful not to make much dust. Then, I found the blade wanted to wander in (or out) and I couldn't do very much to prevent that. I chewed up a couple rolls of 120 before I decided to look for a better solution. Ultimately, my goal is to cut the film exactly 46mm wide, and to avoid as much extra handling as I can I just cut the paper at the same time as the film. Note that my finished product has paper that is too narrow on one side (the cut side) since I no longer have the slight overlap that was there on factory-made rolls. In other words, the paper will be loose on the 127 spool. So far I have not been brave enough to try separating the film from the paper and re-positioning it on new paper of the correct width. I am just living with the possibility of light-piping along the edge and being extra careful. Maybe I will come up with a better way eventually. A laser beam..would make a nice clean cut..lol.. I bought it for not too much from a camera store..broken of course..and had Krikor fix it for a whopping $250-..little did I know that it would be a money pit..and yes..it is amazingly cute..! And in actual useage..way more complex and finiky than the 3.5F..which at least gives me the wonderful neg.. But if they still made Tech pan or similar in 127..maybe that Baby Rollie would appeal more.. But it still looks great sitting on the shelf..yup..a true shelf queen..small, beautiful and ultimately ..useless... to me..
Time to order up some film! See the thread on Ilford 127 film. I have heard that Ferrania will be producing 127 again. Okay, so I took a number of 120 rolls and measured the width of the film and width of backing paper and distance between the flanges of the spool. There is so much variation, I figured if I cut the film/backing paper on the roll, there is no way I could be sure of what the final width of the film would be. So I made a film slitter like the one shown on the auction site. And the first roll of 120 I slit, the film came out at 45.9mm, compared to the factory loads from Efke, where the film width is measuring at 44.5mm. So I thought I was doing pretty good. Cut it to length, 25 & 1/4" and carefully loaded it onto an already used Efke spool with backing paper. Put it in the camera and wound it on, and the camera started performing like it did originally, it just kept winding and the #1 never got to the viewing window. Ended up only getting 8 shots on the roll, and the early shots were jammed up onto each other. So I don't have this worked out yet. Keep at it, I admire your diligence. So I made a film slitter like the one shown on the auction site. That's some quick work! It would take me three weeks to build something like that. Too bad its not working perfectly but maybe there's just some bugs to work out. If I understand correctly, the frame counter is activated when the beginning of the film actuates a little metal tab by the pressure rails. I wonder... If the original 120 tape covers the full width of the new 127-size film, maybe its too "smooth" for the edge of the film to trip that little metal tab? It is for that reason I like to use a new tape, one which is not full width. I cut a little square of tape maybe 3/4 inch square and stick it there in the middle where the film starts, so there is a fresh edge of film on each side. Or it is possible your camera has issues with the film counter. The first roll gave you trouble as well if I remember right? It would be frustrating to not know for sure if the new problems are due to the camera, or due to the film slicing. Hopefully the camera is OK and its just something simple causing the problem now. Good luck! I ended up using the tape from the original Efke roll, which was narrower than the film, so there was a film edge to trip that little metal tab. I think maybe my camera is just screwed up. Of the six rolls now I've run thru it, only two functioned properly. The camera is in pristine condition, so maybe it was never used very much, and being it was made in 1957, maybe the lube in the drive/winding mechanism is just too dried up or gummy. PS: Surprisingly, the slitter works very well. Okay, here's one of the few shots that I was able to get on that cut down roll of Tri-X. Yours Truly, bald spot and all. You can see the white stripe running down the left side of the image. This is a deep scratch in the emulsion side of the film. I first thought it came from the slitter, but when I checked the piece of film that I had slit, then cut off (to bring the length to 25 & 1/4 inches) it was scratch free. Then I studied that little metal tab in the camera and realized is has a rather large burr on one corner. It seems to have gouged the film the whole length. Maybe that is one issue that is causing the camera to miss feed/advance. 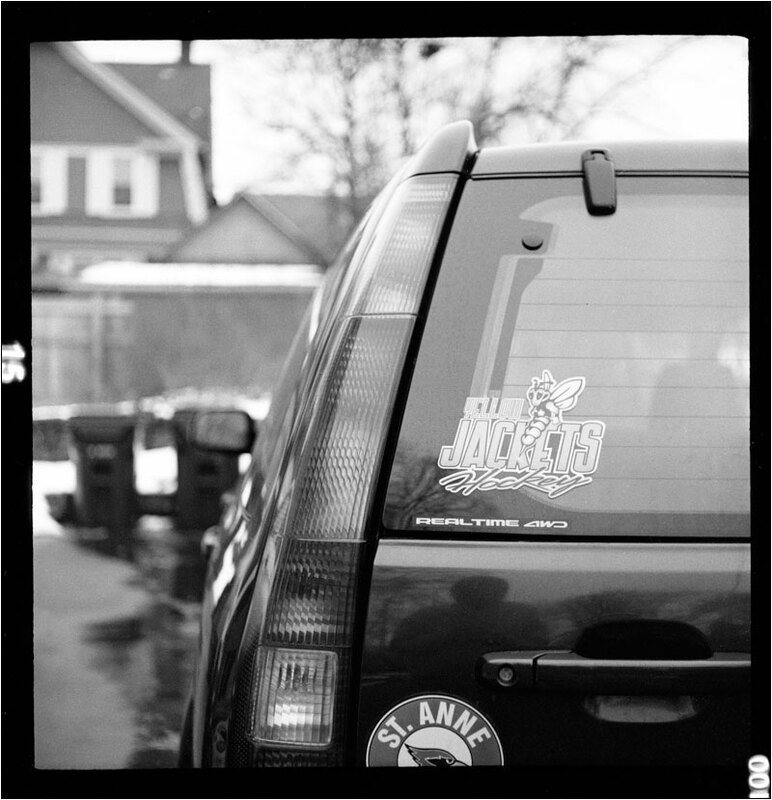 PS: the optical quality of the lens is outstanding, and I like the way it renders on Tri-X. Just wish it worked reliably. You can see the white stripe running down the left side of the image. This is a deep scratch in the emulsion side of the film. I first thought it came from the slitter, but when I checked the piece of film that I had slit, then cut off (to bring the length to 25 & 1/4 inches) it was scratch free. Then I studied that little medal tab in the camera and realized is has a rather large burr on one corner. It seems to have gouged the film the whole length. Maybe that is one issue that is causing the camera to miss feed/advance. Wow, it sure is a tiny little jewel. The lens is really sweet. I know restoring old cars is frought with challenges even if they are pristine. It is kind of like us humans, sitting around is not a good thing. Keep us updated on the fine-tuning, doing a great job so far! What release cable is that? That's an old Leica release cable from like the mid-1950's. Was down at Tamarkin Camera here in Chicago and this old guy came in to sell off his whole Leica collection. He had like three or four of these old Leica cable releases, and I asked if I could buy one. He said, "Yeah." It's the smoothest cable release I've ever owned, and I've had quite a number of them over the last 40+ years. Okay, I'm going with Larry on this. Took off my photographer hat and put on my engineering hat (BSME from 1979) and studied the feed/advance/cocking system (without taking the camera apart). Right next to the little metal lever that signifies the beginning of the film on the backing paper, is a chrome button that gets depressed when you close the back camera door. So the sequence is supposed to be, that chrome button gets depressed, which withdraws the metal lever slightly. Then when the metal lever gets tripped by the front edge of the film advancing through the camera, it pops forward (in the direction of the film travel) and withdraws into the camera body. Then the camera counts out the 12 separate frames. 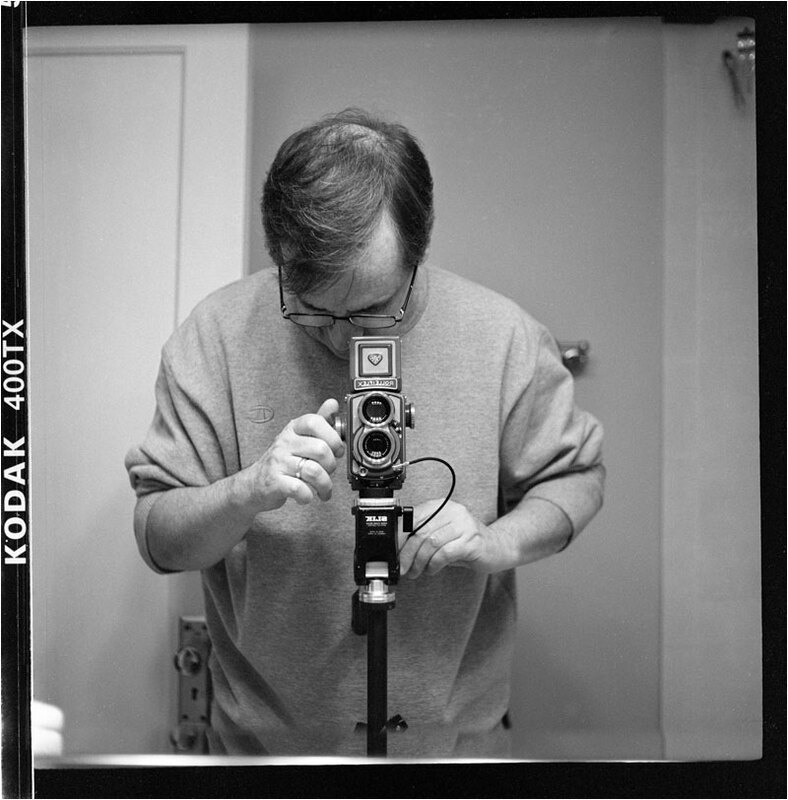 On this camera, the metal lever popping forward and back into the camera body is intermittent, and when it stays out, which I believe it did on the roll of Tri-X last night, it leaves a long scratch the entire length of the film. And the frame counter doesn't operate properly. So I think there's some kind of problem in the internal winding mechanism of this camera which is causing the lever to not withdraw and start the counting sequence. Unfortunately, the one person who was supposed to be the expert on these Baby Rollei's, seems to be out of business. I called the number for Marflex this morning and got some weird Verizon message, and when I called a shop in the same set of buildings as Marflex, they said they saw someone else moving into the space he used to occupy. Larry uses Mark Hansen in Oregon. Thanks Dave. Mark Hansen is actually in Wisconsin now. I did contact him. Also talked with a gentleman who used to service these camera (unfortunately he doesn't anymore). He said this is a common problem with the Baby Rollei's. I thought it was something to do with the winding mechanism, but he said it's actually a part of the shutter mechanism that interacts with the winding mechanism, that causes the problem. The camera needs to be completely taken apart and the shutter mechanism (and winding mechanism) needs to be cleaned, lubed, and reassembled/adjusted. Martin, who was Marflex, passed away in 2013; another good one gone. Sorry to hear that. I heard many good things about his work. Yeah, that is sad. It makes one wonder who will be trained to take the places of those we lose. It is kind of obvious to some, I suppose, but not to me as I have not dealt with something like this with KEH. I know they have a 180-day guarantee, but does KEH actually offer repair service? Seems like I have heard they do use someone here in Atlanta to do that. Not sure how KEH handles the issue Dave. All times are GMT -8. The time now is 19:07.